One of many reasons I am a believer is because of the Jews who survived and have often flourished in spite of having been persecuted and enslaved and were even the subject of genocide many times in their 3000+ year history – (since before Moses really). Another reason is the teachings of Jesus (but not necessarily his divinity). What does this have to do with a biography of Jesus? Well – I know some about the Bible version of Jesus, some strengths and some weaknesses, but Aslan covers much more than that. The Jews were persecuted everywhere, and heavily by Rome, and they’ve not disappeared, they survive in proud numbers. 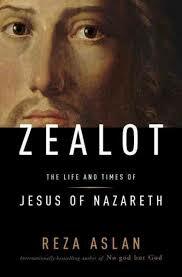 Indeed, if we commit to placing Jesus firmly within the social, religious, and political context of the era in which he lived— an era marked by the slow burn of a revolt against Rome that would forever transform the faith and practice of Judaism— then, in some ways, his biography writes itself. Transforming this revolutionary (anti-Rome) Jesus into a peaceful spiritual leader came later – during the evangelization and Christianization of Rome, between 75 years and 3 centuries later. The history of Jesus goes through many stages from the preaching of Jesus to his crucifixion to the death of Stephen and Paul’s conversion and letters to the Jewish Revolt in 66 CE and winds up somewhere in the Emperor Theodosius and the establishment of Christianity as the official religion of the Roman Empire. Azlan’s direction here is showing that Jesus was a rebel and revolutionary prophet, very much a political radical of the times. This is hardly new. Aslan accepts there may be a spiritual truth which is higher than any scientific measurement but that’s not his point and certainly not my point in reading his book. Aslan runs through the differences in the Gospels and compares that to the Roman Palestine of the times and that’s pretty interesting. I didn’t know the history of Roman-Jewish relations (or internal Jewish struggles) in the era just preceding, during and after Jesus’ lifetime which is covered well enough for my introduction to it. (Remember, I’m NOT a scholar, even if this stuff is old news, my prior information was spotty at best.) And I know this Aslan’s work has been criticized, it’s still a good starting point for me. Overall it’s a good book – not necessarily error-free and no new information or thinking, but it does open doors and avenues of new thought about who Jesus may really have been and why the Gospels were written as they were. The source notes are lengthy and chatty but good reading.